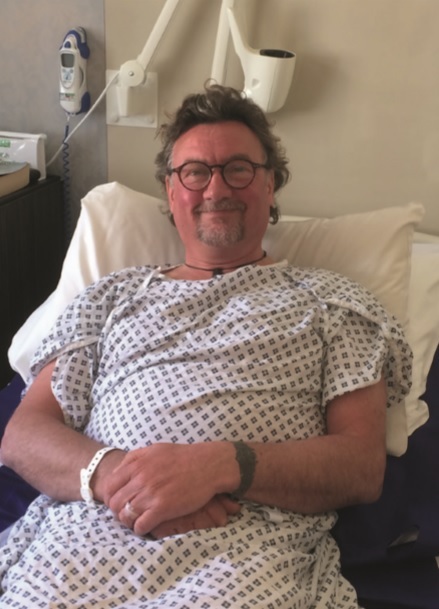 Around 48,000 men are diagnosed with prostate cancer every year and in December last year, Martin Borley, 53, from Tanby Pools, in Surrey, was one of them. “I considered myself ﬁt,” says Martin. “I swam a mile every day and cycled 50 miles regularly plus every year I cycle 300 miles in three days for the O2E (Ordinary to Extraordinary) Charity. “I had no symptoms at all – many men do not!” It was at a routine medical that Martin noticed his PSA test was above the normal parameter at 3.5 and pointed it out. Another test was booked for six months later at which time it was found to be 4.7. “An MRI scan found ‘something’ that needed further checks with a biopsy,” recalls Martin. “This conﬁrmed the scary news that I had prostate cancer in two places but thankfully contained within the prostate and at a Gleason level of 3.3 each.” He continues: “It’s like a punch in the gut and all sorts of emotions swirl around in your head when you hear these words, not the least, how to tell the children. If you would like more information please visit www. prostatecanceruk.org and if you would like to show your support a small donation of £5 gets you the a Man of Men, man-shaped pin-badge to help raise awareness.